Sober Look: What really caused Eurozone banks' balance sheets to grow? Bloomberg's explanation is wrong. What really caused Eurozone banks' balance sheets to grow? Bloomberg's explanation is wrong. A Bloomberg article this morning discussed an increase in balance sheets of Eurozone's banks. It basically made it sound as though the ECB had been encouraging banks to take on more risk via the LTRO program. Bloomberg: - European banks pledged last year to cut more than $1.2 trillion of assets to help them weather the sovereign-debt crisis. Since then they’ve grown only fatter. Lenders in the euro area increased assets by 7 percent to 34.4 trillion euros ($45 trillion) in the year ended July 31, according to data compiled by the European Central Bank. BNP Paribas SA (BNP), Banco Santander (SAN) SA, and UniCredit (UCG) SpA, the biggest banks in France, Spain and Italy, all expanded their balance sheets in the 12 months through the end of June. They have Mario Draghi to thank. The ECB president’s decision nine months ago to provide more than 1 trillion euros of three-year loans [3y LTRO] to banks eased the pressure to sell assets at depressed prices. The infusion, designed to encourage firms to lend, succeeded in averting a short-term credit crunch by reducing their reliance on markets for funding. It also may be making European lenders dependent on more central-bank aid. Draghi is making the Eurozone banks grow "fatter". Please just stick to reporting the news. This is misleading and portions of this article are just wrong. 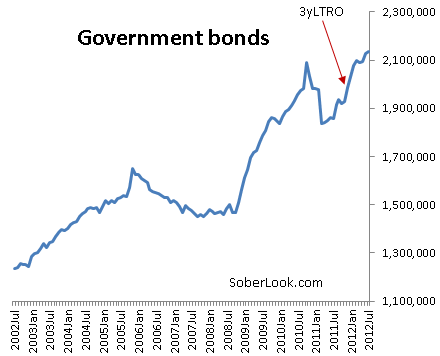 The LTRO program provided financing relief to a heavily strained banking system and created a near permanent dependence on central bank funding. 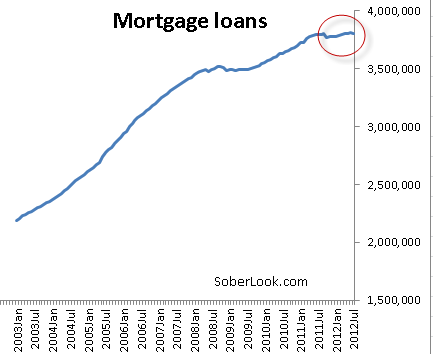 But it had little to do with risk taking by euro area lenders. Let's take a look at some of the key components of the Eurozone banking system's assets.The largest portion of the balance sheets are corporate loans, particularly loans to non-financial corporations. As the chart below shows, growth in corporate loans came to a grinding halt after the financial crisis. 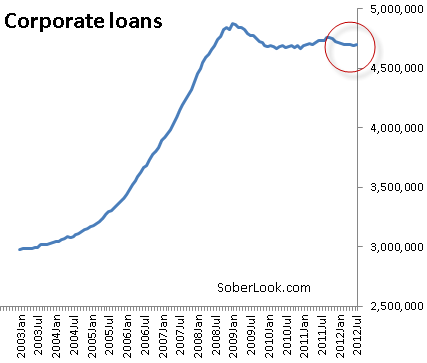 Certainly over the past year, lending to corporations declined. So corporate credit clearly did not increase balance sheets in the Eurozone. The situation with corporate bonds is similar, as banks have not bought more corporate debt. 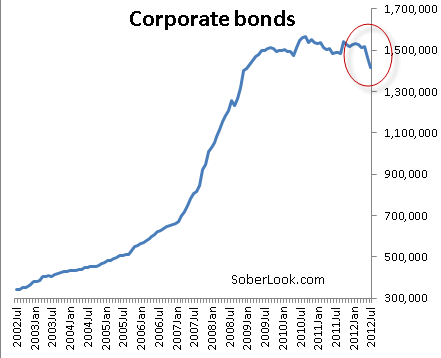 In fact banks have reduced corporate bond holdings during the past spring/summer. 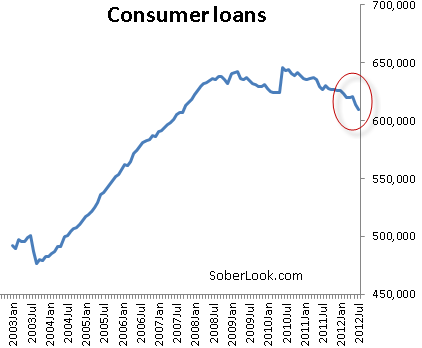 ... while consumer credit (such as credit cards) has been declining for some time now. So what actually drove this increase in assets discussed above? A large part of it was due to accelerated purchases of sovereign debt. Bloomberg: - Banks across Europe bolstered capital instead of selling assets and curbing lending. They did it by retaining profit and swapping debt with other securities, such as subordinated debt, considered to have better loss-absorbing qualities, the European Banking Authority said in July. Some lenders used the ECB’s loans to purchase sovereign bonds. Under current Basel Committee on Banking Supervision rules, banks don’t have to hold any capital against government debt because it’s considered risk-free. Basel rules require banks to maintain varying amounts of capital against assets depending on their riskiness. They allow the largest firms to use their own models to calculate how much capital they need. By adjusting the criteria or swapping assets for ones considered less risky, lenders can reduce their risk- weighted assets, even as total assets increase. Swapping corporate and consumer debt for government paper due to better capital treatment was clearly one of the incentives - particularly as government bond yields in the periphery rose (the "crowding out" effect). But it wasn't just the fact that funds were made available by the ECB that spurred this bond buying. It was the periphery governments who "encouraged" banks to purchase their paper (see discussion). And some governments even provided guarantees on banks' own paper to be used as collateral in order to give banks more "buying power" (see this discussion). That's why banks' holdings of sovereign debt in the Eurozone are now at record levels. Bloomberg's assertion that banks somehow did not want to keep their "promise" to reduce assets due to Draghi's program is nonsense. Draghi's 3y LTRO obviously provided the opportunity for banks to purchase more sovereign debt and lock in the spread differential between bond yields and the ECB's 1% financing for 3 years. But banks would certainly not have loaded up on all this government debt on their own - the additional exposure made the share prices more volatile. It was the governments who pressured their nations' banks into participating in their bond auctions - since very few others would "show up". Italy and Spain clearly did not care if banks' balance sheets would increase as a result. And it was done at the expense of lending to the "real economy", pushing the Eurozone into its current recession.